I know higher education is expensive, and about to get more so. But it does provide soul food, a chance to learn new things and often, a real career boost. For people who are thinking of working on a book, an MA in Creative Writing is a real boon. As well as giving you the chance to think, it provides a structure, and deadlines, and a supportive atmosphere, and feedback on the work in progress – that kind of sustained professional help is hard to find, and makes a huge difference. And the pride from achieving an MA is immense. There is endless snobbery about whether you can ‘teach’ good writing but I have never understood this; the painter or musician is not generally scorned for undertaking formal study. Of course the spark of creativity must come from within, but people can and do learn from others. To teach writing is to acknowledge the labour, and the conscious desire, involved in discovering one’s material and crafting it to produce particular effects. Creativity depends not just on inspiration, but also on extensive experience and apprenticeship. I have a vested interest, as I teach on a creative writing programme, and applications are open now for the Masters degree next year. But I also think it matters, and I like the degree that we put together at Roehampton; a lot of thought has gone into the curriculum, which offers some unusual options, and into the way it is delivered. For one thing, we think we are the only ones in the UK to offer an MRes, which focuses on a single, longer work, and one of the few to include Creative Nonfiction, which covers reportage, memoir, travel writing, biography and the lyric essay. 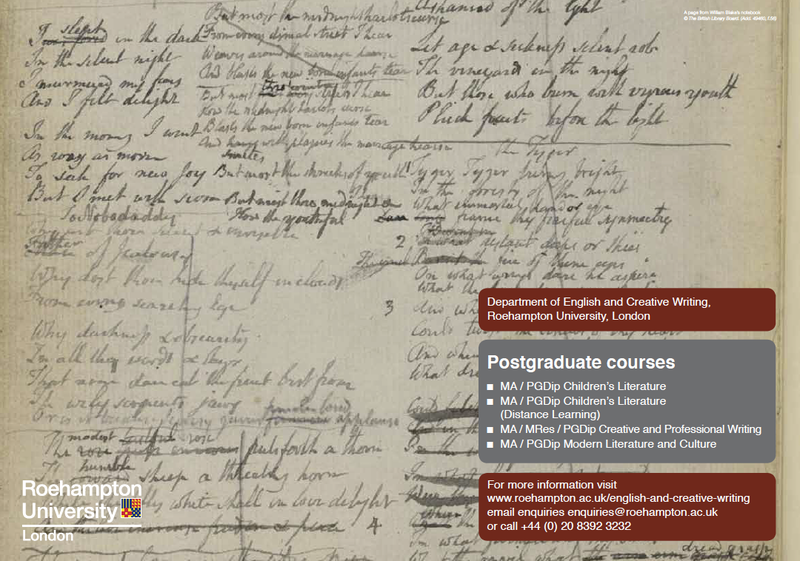 Next summer, we are rolling out a new module in Teaching Creative Writing, and another in Publishing and Editing. The aim is to give writers an awareness of the rapidly changing publishing landscape. And perhaps publishers can benefit as well, because a creative writing degree helps to see text as part of a process, not just a final, finished product. This work is licensed under a Creative Commons Attribution-NoDerivs 2.0 UK: England & Wales License.